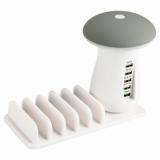 5 USB Ports Charger with Stand and Light comes with circuit protection to ensure safety and high performance. Just take it. 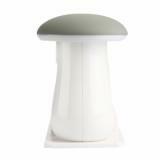 The cute mushroom style adaptor comes with 5 usb ports and can work with most phone and iPad in the market. 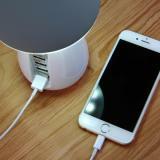 It can also be used as a lamp or a phone stand, multiple functions gathering in one little device which is very convenient and efficient to use. 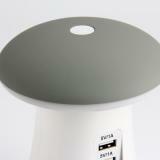 • Quick link: K1 Wireless Phone Charger. Very simple to use. I noticed that some people said this had to be placed a certain way in order to get a charge, but I haven’t had any issues. Just place you phone centered on the circle and it should charge. I’m ok with the light, it’s small and not as bright as some people are saying it is. If have my charging station by my computer and whenever I’m not using the phone I just set it on for a charge, when I need it I just pick it up and there’s no cord to hassle with. It’s great I love it. I bought this for charging my cellphones and iPad. And very important thing is I can read the book before sleep. It’s great design and quality. I am fond on it. Absolutely love it. It's bigger than I expected and the light is powerful. The stand fit everything, even my iPad Air, but it's not wide enough for AirPods, so I made mine rest on it in the front which looks pretty neat. 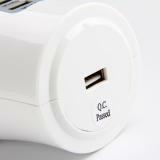 Great for traveling in hotels, and cruises. Never had a problem with not enough outlets. I took in my last trip out of the country during Christmas and a friend loved it so much, I gave it to him. So here I am ordering another one. I absolutely LOVE this Charge Stand!!! 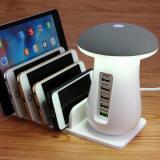 Perfect to put on my desk and charge all of my devices!! Love it!!!! This product is really awesome. Had one before where its just a charging station but this one is different. It gives me a night light which isn't super bright to a point that it bothers me when I'm sleeping and gives me the same function as a charging station I can put next to my bed. This is a nice charge station now my grandaughters dont fuss about a charging cord. And i live the lite. Makes it easy to see wen i plug in stuff. Love it.